Halloween in the alley – or as we called it, “Alleyween“, set the bar high but that just means game on when it comes to Christmas! When brainstorming ideas for decor, the Hubs and I were thinking about what would be most appropriate for our alley garden. 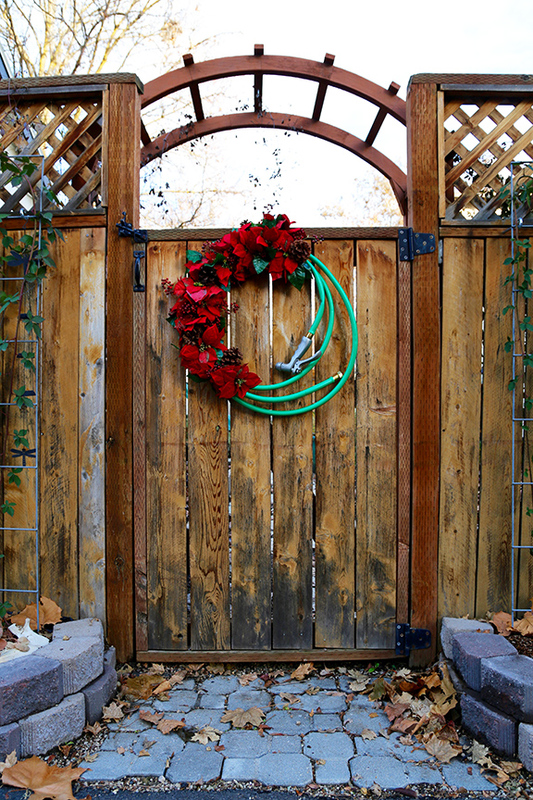 Let’s see… what’s round and would make a good base for a wreath? Well that would be a garden hose, of course (like you didn’t see that one coming). 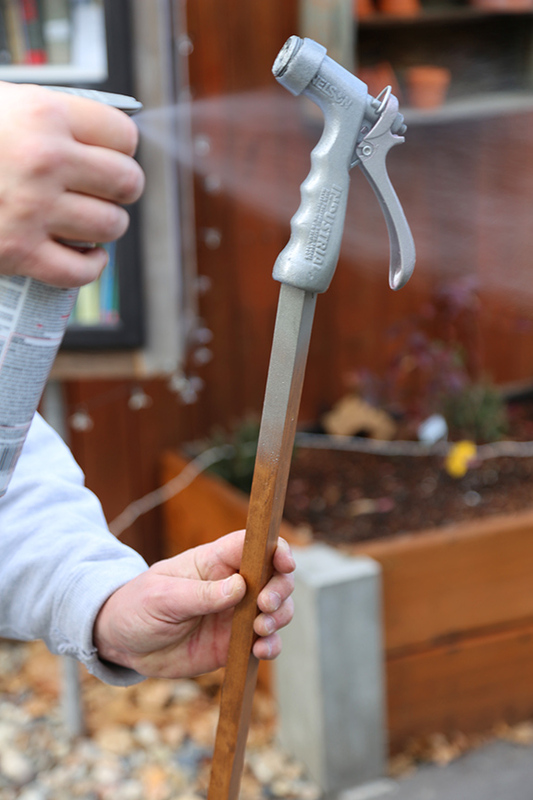 Now these alley projects are on a budget so it’s not just the glue gun that has to get crafty. I started by scouring the local thrift shop and scored a huge bouquet of silk poinsettias, a bag of pinecones and some red berries for around $5. Next to Home Depot to purchase the least expensive hose possible. The Hubs is a bit of a garden hose snob so he didn’t even want to be seen with the girl toting the $7.98 model. We had a spray nozzle that wasn’t working so well, so I decided to give its life a new, sparkly purpose with a coat of silver spray paint. While that was drying, it was time to heat up the glue gun and see what I could do about sticking some fingers together. We stretched out the hose and tried to get it to relax (maybe I should have given it a glass of wine?) as much as possible. 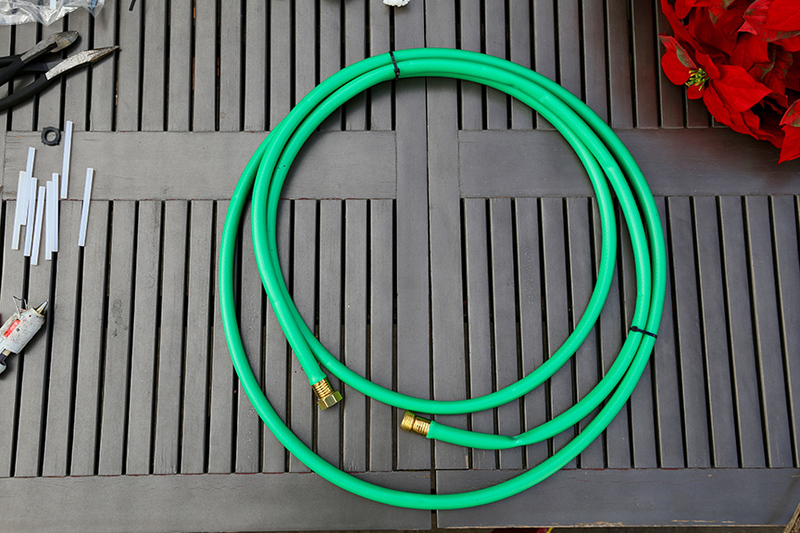 That is the price you pay – or don’t pay as the case may be – with the el cheapo hose – it’s definitely more prone to kinking. 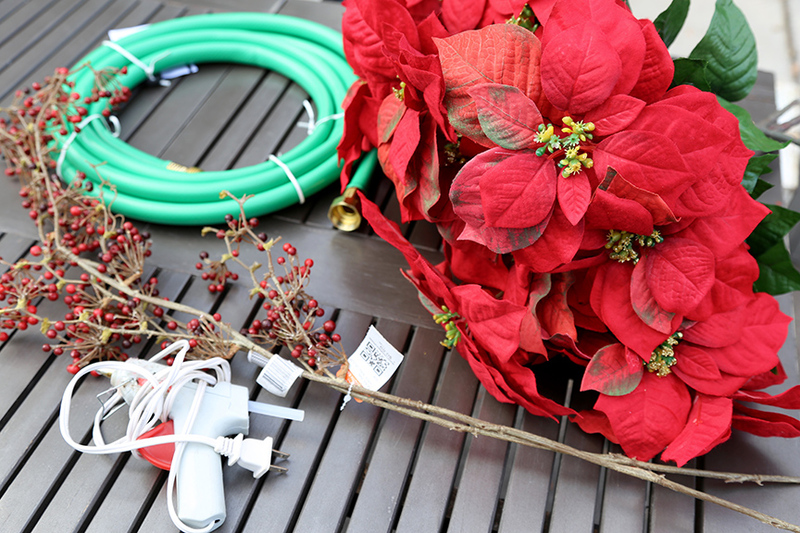 Wrap the hose in the configuration you want – loose, tight, symmetrical, not – and secure with zip ties. 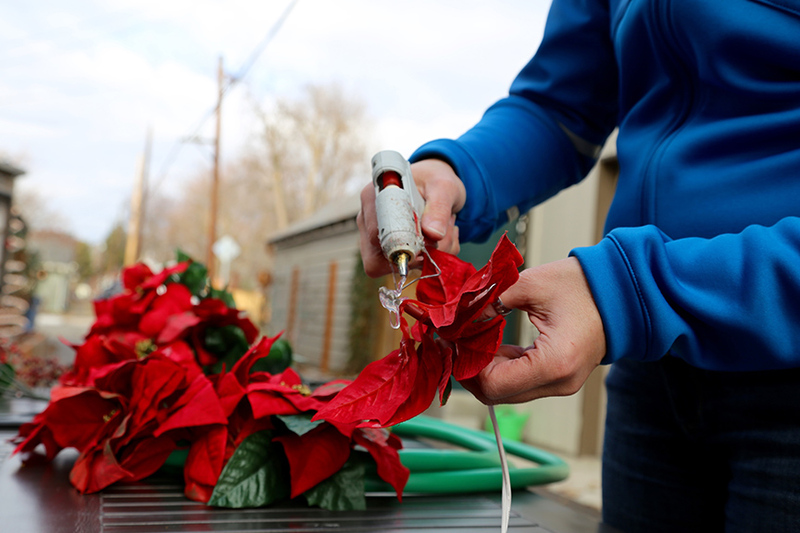 Using wire snips, I cut the poinsettia flowers from their stems and started glueing liberally and sticking to the hose, filling in with the poinsettia leaves, red berries and pinecones. I’d glue a few things, step back, see what was missing and start glueing again. It didn’t take long before I was hanging it on this cute little gate. 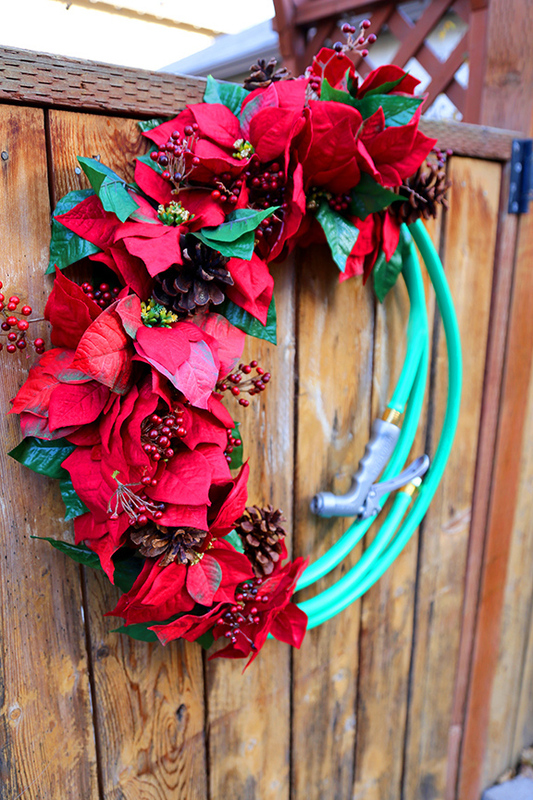 Easy-peasy, fun to make and the perfect holiday decoration for the alley. I’m feeling so crafty, I just might have to make one for every season.